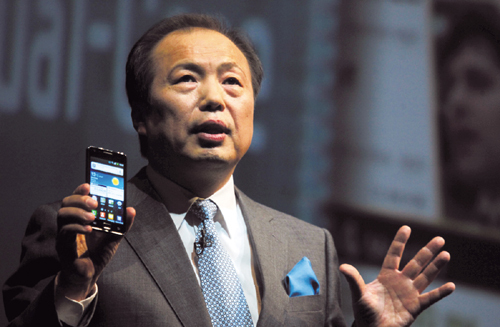 Shin Jong-kyun, president and head of Samsung Electronics’ Mobile Communications Business, explains the major functions and features of the Galaxy S II at a session prior to the opening of the Mobile World Congress 2011 in Barcelona. Samsung Electronics Co., a leading mobile phone provider, announced the Samsung Galaxy S II (Model: GT-I9100), a beautifully thin (8.49mm) and lightweight, dual-core smartphone that combines an unmatched viewing experience with incredible performance in an event on Feb. 13 one day prior to the opening of Mobile World Congress 2011 in Barcelona. POWERFUL PERFORMANCE - Incorporating a dual-core application processor and advanced wireless network (HSPA+ 21) connectivity, the Samsung Galaxy S II has the speed and power to provide an unrivalled mobile performance. Dual-core application processor delivers compelling features such as fast web browsing, multi-tasking comparable to a PC-like environment, supreme graphics quality and instantly responsive 3D user interface on the large screen. 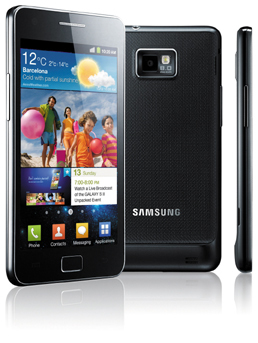 The Galaxy S II also delivers seamless multitasking, switching between applications instantly. Superior 3D hardware performance makes games and video incredibly fast and smooth. With super-fast HSPA+ connectivity, the Galaxy S II offers rapid mobile download speeds while BlueTooth 3.0+HS considerably reduces data transfer times. A NEXT LEVEL OF VIEWING EXPERIENCE - The Samsung Galaxy S II has been equipped with Samsung’s new crystal-clear Super AMOLED Plus screen, the most advanced mobile visual display ever created. Setting the standard of quality viewing on mobile, Super AMOLED Plus introduces the best in quality in color gamut, contrast ratio and edge sharpness. Using RealStripe screen technology and a greatly increased sub-pixel count, Super AMOLED Plus complements the mechanics of the human eye to recognize images look clearer and more detailed than ever before. With a wider viewing angle and increased visibility in outdoor, the Samsung Galaxy S II provides a more vibrant viewing experience than any other mobile devices. GALAXY S II GOES TO WORK - Samsung has introduced a new range of enterprise mobility solutions, expanding the business capabilities of the Samsung Galaxy S II and helping enterprise customers empower a flexible and connected mobile workforce. Samsung has partnered with IT industry leaders to offer the most relevant enterprise solutions to the Samsung Galaxy S II, working seamlessly on the Android Gingerbread platform and paying special attention to securing data and network. These solutions include enhanced conferencing and connectivity services from Cisco, the most comprehensive mobile implementation of Microsoft Exchange ActiveSync and secure remote device management from Sybase. Samsung Electronics posted a record 154 trillion won in sales in 2010, a 13.4 percent surge over the previous year and 17 trillion won in operating profit in 2010, a 58.3 percent jump. Riding on these remarkable achievements, Samsung Electronics saw its stock price surpass the 1 million won barrier on Jan. 30, the highest level on the Korea Stock Exchange, for the first time in history. The Samsung Electronics stock closed at 1.01 million won on that day, up 16,000 won or 1.61 percent over the previous day, surpassing the last record high closing price of 998,000 set on Jan. 26. Releasing its business performance for the fourth quarter of 2010, the Korean electronics giant said they raked in 41.87 trillion won in sales and 3.01 trillion won in operating profit in the fourth quarter of last year. For the year, Samsung reported 154.63 trillion won in sales, 17.30 trillion won in operating profit and 16.15 trillion won in net profit. The figures for the whole of 2010 were higher than their initial estimates of 153.76 trillion won in sales and 17.28 trillion won in operating profit. 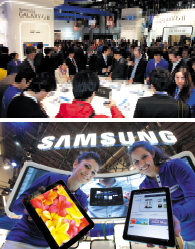 The feat was owed to the fact that such mainstay businesses as semiconductors and mobile phones have maintained differentiated competitiveness and widened market shares despite such uncertainties as sagging IT demand caused by the global economic slump and ever-surging competition, Samsung Electronics officials said.